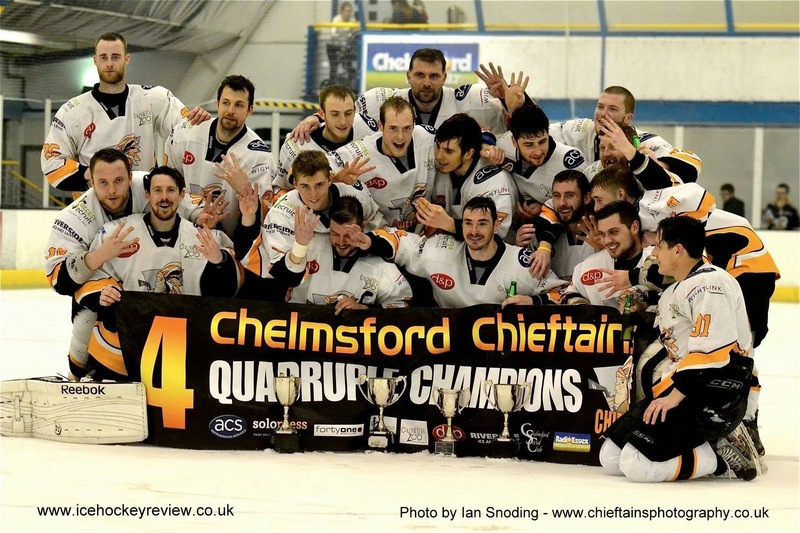 Chelmsford Chieftains beat Wightlink Raiders 3-0 on the night, 6-3 on aggregate to lift the NIHL Play-off trophy in front of a packed Riverside crowd last night. More than 1000 hockey fans were present as the team completed a dream Quadruple season, a clean sweep of all four pieces of available silverware. After a scoreless 1st period Michael Ranby scored 2 minutes into the 2nd period t...o lift what was a tense atmosphere and further goals from Ross Brears and Matt Turner sealed the deal. They paraded the play-off trophy along with the League Championship, League Cup and South East Trophy after the final buzzer. The retiring player/coach Gary Clarke left the ice under a tunnel of hockey sticks, a guard of honour prepared by his appreciative squad of talented players. Celebrations lasted long into the night as both players and fans celebrated the most successful season in the club's 26 year history.